What came first : Daan or Dead Man Ray ? A question about as difficult as that one of the chicken and the egg. The question : "Who did you like first" is probably much simpler : "Daan" was a well-kept secret before DMR, while that band took everybody by storm with the inventive pop on Berchem last year. 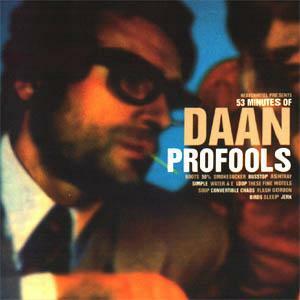 With this solo-cd, on which a good number of tracks from earlier than the DMR-project, Daan proves however he is probably responsible for more than 50% of the inventity & sound & songwriting on the cooperation with Rudy Trouvé. If you know "Berchem", you can suffise with the knowledge that this cd is very much an extension of what could be heard there (and you'll probably find this enough said to go and find that cd in the nearest record shop). Tracks such as "Boots", "50%" and the irresistable "Busstop" (in which he gets really mad with the fact that "this is no busstop, it's just a shelter from the rain") ... could've figured on "Berchem" effortlessly. Something that's new on this cd is the close coöperation of Daan Stuyven with Herman Gillis - inventor of the Sherman Filterbank (a sort of miracle-sound-box that is the toast of the town nowadays for everyone who's flirting with techno (eg. Madonna, Björk ...), ex-member of teh New Beat-producerstrio Morton Sherman & Belluci, ex-Poësie Noire, but also co-ex-Word & Running Cow. His Chaos- en Filterbank contribute a big part to the sound of the more danceable tracks such as "Jerk", "Water & E" (drum'n' beats) & "Convertible Chaos". The fact that "Profools" is a home-recording, makes the sound quite lo-fi, but this is hardly ever something disturbing (exceptions "Soup" & "Flash Gordon"). Sometimes the sound is even alarmingly beautiful (alarminly for the people that have invested in expensive studio-equipment that is), such as on the bittersweet country-song "Ashtray" or the weird "Birds". "Don't use orange in a coroner's logo. Don't cry for me nor Argentina, Don't wash the cabbage if you're in love with the caterpillar, Don't blow candles on hostile cakes, Pick up phones when they ring at you ...", are just a few sound advices he launches at us on the track "Simple". We'd like to add "don't neglect happiness when it smiles at you in the form of a cd". - Dirk Steenhout in Café Des Arts (De Morgen) : "For Stuyven music is a way of life, a therapy, a way to turn the daily stress & chaos of the life in the city into a something creative ... If you take some time to let the songs get to you, you'll soon realize that Daan is a talent to be very very careful about." - On the cd, the internet-adress http://www.dma.be/p/heavenhotel is printed. That's a good & solid 404 for ya, but maybe this will change in the future ?? - More info on Dead May Ray can be found on their page in this archive. You can order this CD from a number of locations (prices researched on September 12th, 1999, but nothing guarantees they still are the same when you read this).